Today is Wednesday, and that means it is Shop Shots day. I was going back to get the volume number for today’s post. I didn’t realize that the last Shop Shots was from BFI! Holy smokes. 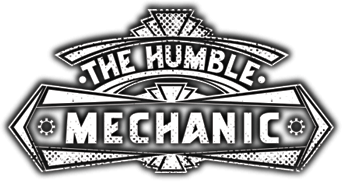 For those of you that are new to the blog, Shop Shots is something I started to share the things that automotive techs see. With these pictures I can get into a little more detail than I can with a post of Facebook. First up we have a split control arm bushing for a MK4 Jetta wagon. Just below where the nut and bolt is, you will see what is left of a bushing. This Jetta has about 220k miles on the original bushings. This bushing failure is somewhat common on this generation of Golf/Beetle/Jetta. I have to say, this is the worst one I have seen. This car must have been making one heck of a noise for a while. Next up is also a VW bushing issue. The last failed bushing was a lower bushing, this is an upper one. 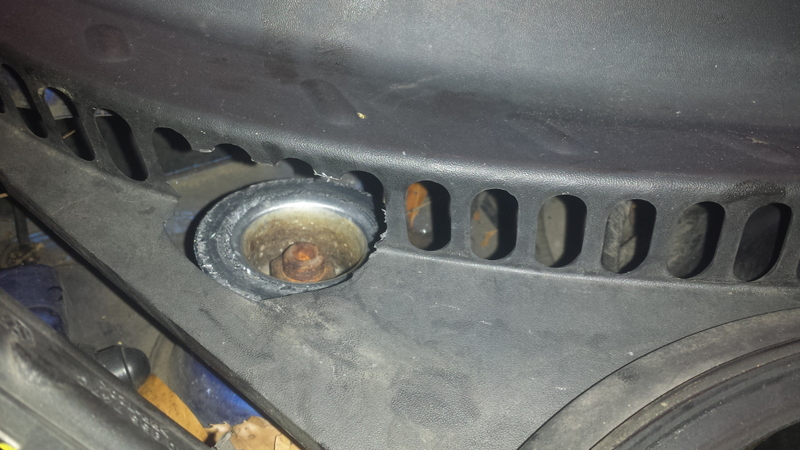 The upper strut tower bushings completely broke apart. Because of that, the strut cap popped up and broke the trim at the bottom of the windshield. 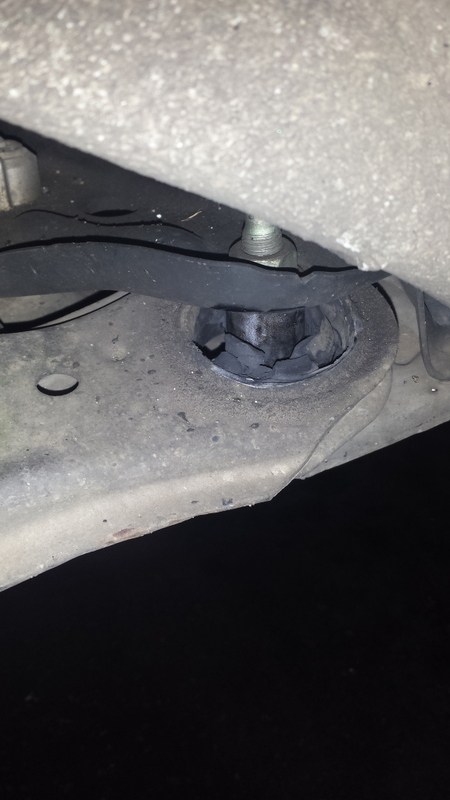 I have seen a ton of collapsed strut mount bushings over the years, but never one that broke the trim. I promise that I didn’t plan for broken Jetta suspension day today. This picture has just all kinds of bad things happening. 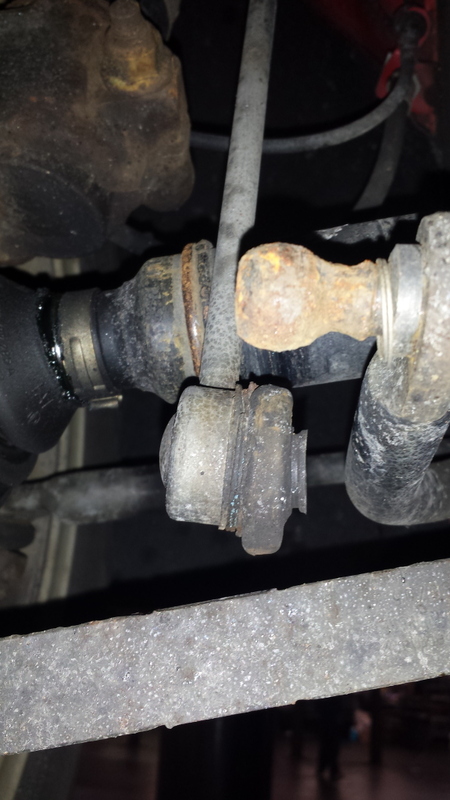 In the foreground of the picture, you see a swaybar link that has completely come apart. That is the really rusted part. In the background, you can see that the outer CV boot is split. The funny part is, the customer told us he didn’t want to know ANYTHING that was wrong with his car. He just wanted the oil changed and nothing else. I guess in this case, ignorance is bliss? Maybe? Looks like one good pothole and that upper strut bushing failure would grenade the windshield. “Gee I dunno, hit a bump and the windshield blew apart.” Of course the customers never heard any noise. Was it pick on Jetta Day? I sell these same parts, so it was very interesting to see how the parts wear out and fail.